The drink glass manufacture can be broken down into three simple manufacturing phases, the batch house, the hot end and the cold end. The technique being used for contemporary glass production is still quite similar to the ancient technique the Egyptians were using in around 3000 BC. Of course certain techniques have been modernized and we use them for Promo Drinks Glasses. 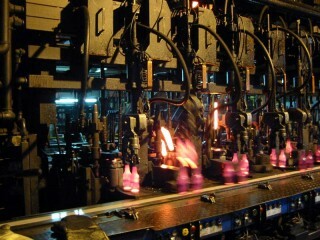 Drink Glass Manufacture – The Batch House: Raw Material procurement. There are four main raw materials involved with the manufacturing of glass. The ingredients are, silica sand, soda ash, limestone and recycled glass (also referred to as cullet, which is crushed glass). Silica sand composes about 75% of the ingredient in contemporary glass production. There are a few various material additives depending on the color, density and thickness of the glass that are added in during the “hot end” processes. All these raw materials are kept in separate compartments before being transferred to the furnace. The first step of the process is the furnace. This is where the molten glass is poured from the feeders into the furnace (powered by natural gas or fuel oil), which heats the molten glass at a temperature between 1000°C – 1500 °C. At the end of this process the molten glass is ready to become a glass product and move on to the next phase. Second step, is the forming process, this is where the molten glass takes the desired shape of your liking. There are two main types of forming processes, the blow and blow or the press and blow process. (Will update blog later with more details of production process). For each process, a certain amount of molten glass is poured into the machinery, this is referred to as a “gob“. Certain machines can handle several gob sections. In this process of the production the forming machines are where the moulds give the desired shape. The most common machine is the “Individual Section“. The machines are lined up on a section where the gob distributor moves along the chute to distribute the hot glass in the mold. The gob distributor can contain from one to four containers simultaneously. All in all these processes contribute to the drink glass manufacture! The third step of the hot end is the internal treatment or also called the dealkalization. This step is very important in order to improve the chemical resistance of the inside of the glass. It is usually done by injecting fluorine or sulfur with a gas mixture. The fourth step is the annealing process. After the forming process the glass is extremely hot and needs to be cooled down. 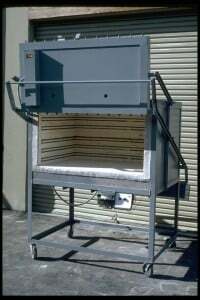 Annealing or “Lehr” (as it is known in the industry) is the process where the glass is cooled down by using an annealing oven. Glass is very fragile when hot and needs to be cooled in a very specific way in order to avoid uneven cooling which will make the glass weak and cause it to break at later stages or when the consumer uses it. The annealing oven starts off at 580°C and then cools down to low temperatures, the lowest temperature depends on the thickness of the glass. The process can last anywhere between 20 to 6,000 minutes. At the end of the “Hot End” each product is applied a service treatment layer. A thin layer of tin oxide using an organic or inorganic compound which strengthens the glass product. Once the glass has cooled down and received the first service treatment it can move on to the “cold end” process. The first step of the “Cold End” process is the second service treatment. The glass is applied with a thin layer of polyethylene wax via a water based emulsion technique. The objective of this treatment is to make the glass slippery in order to protect it from scratching and preventing containers from sticking to each other. The result of the treatment makes the glass’ surface virtually unscratchable. The combination of the two service treatment layers are referred to in the glass industry as “strength retaining coatings”. The “Cold End” process mostly involves quality control of the glass products, packaging and labeling of the containers before sending the shipments to customers. All glass products pass through an electronic machine that automatically detects any defaults that occurred during the “Hot End” process of manufacturing. The machines test several elements such as the thickness of the wall, squeeze testing, sealing surface inspection, side wall scanning and base scanning. All the information is relayed back to the “Hot End” forming machinery so that the appropriate adjustments can be made in order to avoid repeating the problem. Any rejected bottles are destroyed and returned to the raw material compartments, they are recycled as “cullet” for making new molten glass. Checks: small cracks in the glass. Stones: foreign inclusions, pieces of refractory material that entered the furnace by the molten glass. Blisters: bubbles in the glass. Tear: happens during the press and blow process. The Cold End process also includes secondary services such as labeling and packaging of glass products. The standard labeling process is called the ACL (Applied Ceramic Labeling process). The label is printed using a screen printing technique with “vitreous enamel paint” that is baked onto the glass container. There are three other techniques for print labeling: etching, coating and Applied Ceramic Labeling. Packaging for glass products is usually performed by an automatic machine palletiser. Each pallet can be between 4 to 11 layers high and contain up to a maximum of 5,000 bottles or glasses. The drink glass manufacture process is a very polluting process, typically a ton of glass material emits between 500 and 900 kg of CO2, assuming a gas-fired furnace and coal-fired electricity are used for the manufacturing process. It is a good thing that glass products are 100% recyclable, the glass industry and government regulation in many countries in the world push for high prices on cullet in order to ensure high return rates on glass products. Developed countries have return rates close to 95% on glass products being recycled (Sweden, Denmark, Finland). 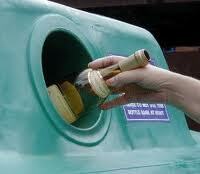 On the other hand in less developed countries the recycling rates are below or around the 50% mark. More work needs to be done in order to not waste glass that can be reused in the manufacturing process. Recycled glass still emits pollution because the glass containers need to be washed using fresh water and chemicals, remelting glass products also emits carbon dioxide. On the other hand less raw materials will be used when glass is recycled which is an important factor to consider since we are living in a finite resource planet. Promo Drinks Glasses – What more to learn? Glass recycling is an easy step for any customer as local and industrial size recycling programs are in place in most countries of the world. Contact ODMasia for any requests for glass mold design and any type of promo drinks glass, such as beer mugs or shot glasses. U’Luvka Vodka – Innovative Packaging and GWP.